Susan M. Gallant collaborates to create learning experiences that inspires clients to grow, change, or adapt. Presence is a quality that's difficult to define, and yet we know it when we see it. Presence arises from a combination of our energetic resonance, self-awareness, and effective behaviors. Worldview impacts everything we think, do, believe, create, decide, and see. Everything! The Mechanic Meets the Gardner is a jaunt through two contradictory worldviews that filter what we experience as real and believe to be true. Dr. Gallant is proud to have been a part of the 2nd edition of the soon to be published NTL Handbook of Organization Development and Change. Beliefs: Put Down the Potato Chips! In this article Dr. Gallant describes the notion of beliefs and invite you to identify a self-limiting belief, engage in a reflective process, and then choose what will facilitate getting more of what you want. It’s your choice! Copyright© 2009 - 2018 SM Gallant, Dr. Susan M. Gallant. All Rights Reserved. No content contained within this website can be used, copied, or reproduced in ANY WAY without the express, written permission by Dr. Gallant. I am a Leadership and Organizational Development consultant and provide executive coaching as well. I believe that my engagements should be productive, challenging, encouraging, and fun! I ask important questions which support you to confront contradictions and explore your own truths. We build your capacity for self-awareness and empowerment. This increases your ability to self-manage and lead within the systems you work, live, and play. Together we create action plans or design experiments that enable you to move toward your most desired outcomes. Worldview impacts everything we think, do, believe, create, decide, and see. Everything! 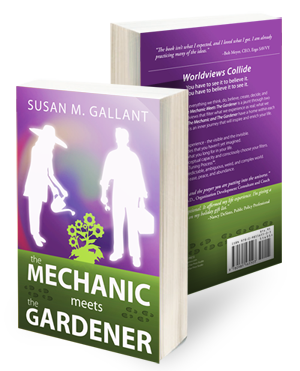 The Mechanic Meets the Gardener is a jaunt through two contradictory worldviews that filter what we experience as real; what we believe to be true. The Mechanic and the Gardener have a home within each of us; their meeting is an inner journey that will inspire and enrich your life.